is a World Class Company Devoted to Providing the Finest in Diagnostic Ultrasound Imaging Available. InSight Ultrasound Specialists, Inc. was established in 2005 by Robert Rosner, RVT, RDMS, RT, AAS, a board certified Diagnostic Vascular, Cardiac, and General Sonographer, with extensive training and experience in the field of Medical Ultrasound for the past 38 years. Professional reads are provided by Stephen M. Ross, MD. 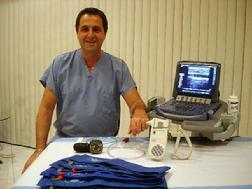 Dr. Ross is certified in multiple specialties by the American Board of Radiology and has been practicing for 25 years. Internal Medicine Associates, Cape Coral, Fl. LMR Imaging at Riverwalk, Fort Myers, Fl. Naples Diagnostic Imaging Center Naples, Fl. Cape Coral Hospital, Cape Coral, Fl. Park Avenue Radiologists, New York, NY. New York Medical Imaging Associates, New York, NY. Doctors Hospital, New York, NY. New York Hospital - Cornell Medical Center, New York, NY. Board Certified by the American Registry of Diagnostic Medical Sonographers in Abdominal, Obstetric, Gynecologic and Vascular Sonography. Co-authored published article, �Color Doppler Flow Imaging in Central Vein Occlusion. Hemodynamic Evidence of Ischemia,� as well as performing all exams in this study. Active participation in fine needle aspirations with recently-developed �Ultrafast Papanicolaou Stain,� a new staining method developed by Dr. Grace Yang, Cytopathologist, New York Hospital � Cornell Medical Center. This technique, a modification of the Papanicolaou stain, was profiled in The New York Times science section, April 25, 1995. For more information on the effects, treatment, and prevention of Cardiovascular Disease, click on the American Heart Association� logo.